Max Planck Florida Institute CEO and scientific director David Fitzpatrick and Abdel Barraj, sales leader for Zeiss Microscopy North America. 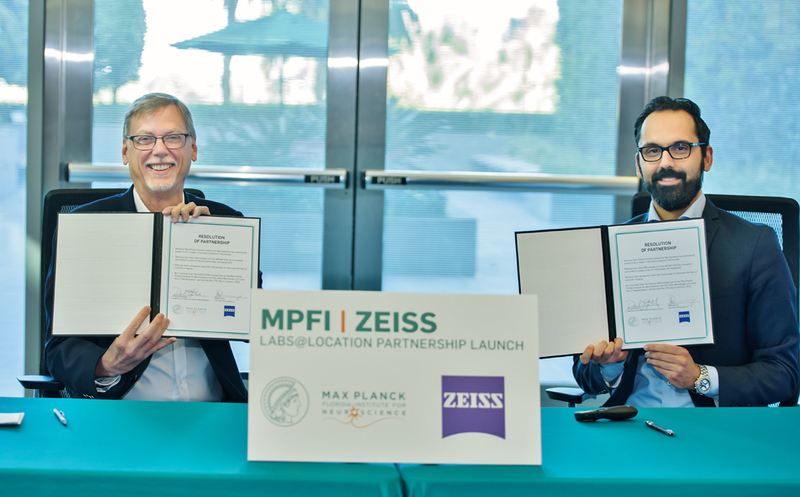 The Max Planck Florida Institute for Neuroscience has a new “[email protected]” partnership agreement between the MPFI Electron Microscopy Core Facility and German-based microscopy company Zeiss, which is known for cutting-edge imaging technologies. The institute is only the third in the United States to earn the [email protected] designation. The institute will have access to state-of-the-art Zeiss technology before it is commercially available, providing researchers with innovative imaging tools that will empower their search for new insights into how the brain works.